Fruit Bleach:- Based on the combination of citras fruit formula, this natural bleach is fortified with AHA and improves the skin complexion. Can be used on all skin types. 2-3 times application in a week gives improved results within 4-6 week. Use : Apply this bleach cream on the clean face and neck. Leave it for 15-20 min gently clean with wet cotton. Use atleast 2-3 times in a week. Zordan Herbals Fruit Bleach Cream is a unique multi action preparation. The free oxygen along with fruit and herbal extracts penetrates into the skin to provide actives in deep layers of skin. It evenly blends the facial hair with your complexion, while the fruit extracts give your skin the natural glow. 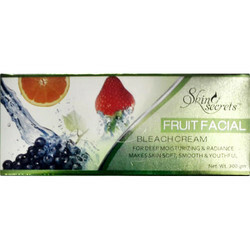 Fruit facial Bleach Creme provides the freshness of fruits and unmatched fairness to the skin. Fruit Extracts make skin soft and glowing. Our Fruit Bleaching Cream is formulated under ISO certification. The skin illuminator gives you a visibly fairer complexion. Multi benefits of clear face bleach cream includes perfectly light colored facial hair to match skin tone and provides fresh looks with its fruit anti- oxidants. Size Available: 1kg, 250g, 43g, 15g. Glowing Buzz Fruit Bleach for all beautiful women out there. Its unique formula removes dirt, oil and other pollutants from your skin. It evenly blends the facial hair with your complexion while fruit extract give your skin a natural glow. We are reckoned entity of this domain engaged in providing an enhanced quality Bleach Cream.